Fanless graphics cards are relatively rare these days, but they tend to attract a fair bit of attention from silent PC enthusiasts when they do appear. 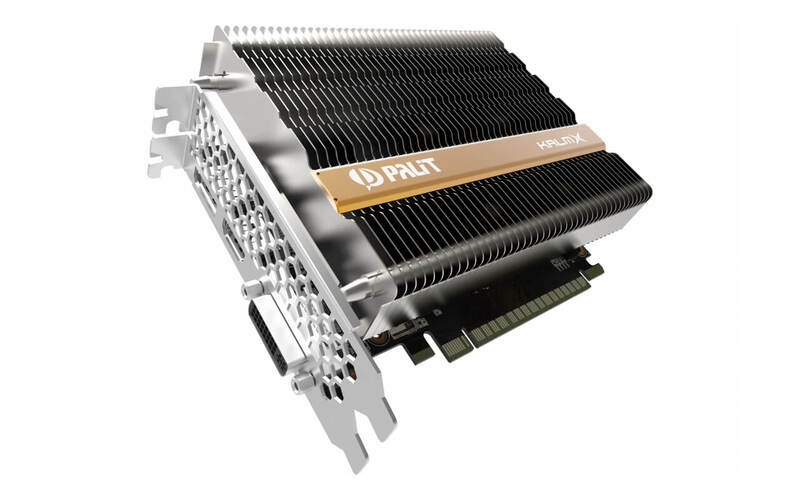 The latest fanless card to hit the market is Palit's GeForce GTX 1050 Ti KalmX, which naturally includes a massive aluminium heatsink. The KalmX is a double-slot, full-height variant of the GTX 1050 Ti, with its enormous heatsink extending well above the top of the PCB. The card isn't much longer than the PCIe x16 slot, although two large heatpipes do extend beyond the board in this direction. The GTX 1050 Ti packs a TDP of 75W, which explains why this heatsink is so large. Most 1050 Ti cards pack a dual-fan solution with a flatter, longer heatsink, but Palit's solution requires much more metal to achieve the same heat dissipation. Palit has opted to use the GTX 1050 Ti's stock clock speeds – 1290 MHz with a 1392 MHz boost – to avoid any extra heat issues from overclocking. Unfortunately there is no word on how much the GeForce GTX 1050 Ti KalmX will cost, or when you'll be able to buy one. Most GTX 1050 Tis sit around the $140 to $150 mark, and we expect the KalmX will come in slightly higher than this due to its premium cooling solution. If you want to know just how a fast a GTX 1050 Ti is, check out our full review and performance benchmarks.